Enjoy an afternoon of relaxed dining on the home straight leading to the winning post. 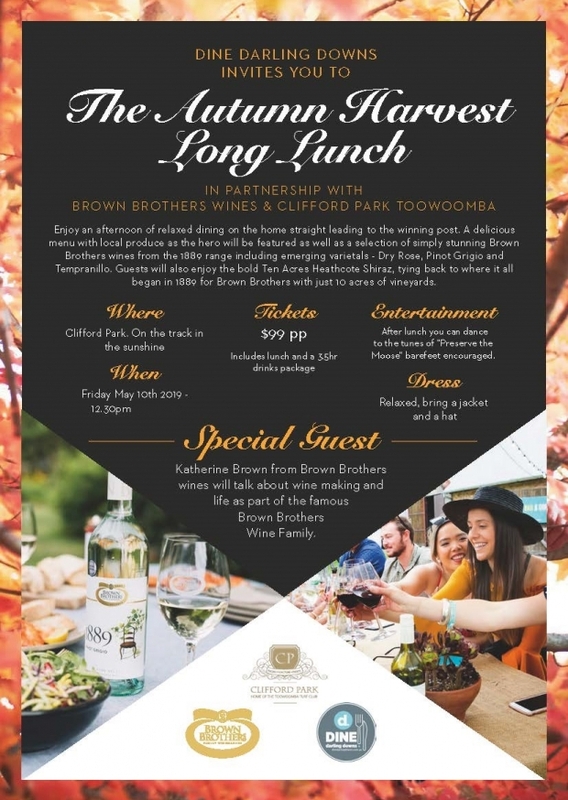 A delicious menu with local produce as the hero will be featured as well as a selection of simply stunning Brown Brothers wines from the 1889 range including emerging varietals - Dry Rose, Pinot Grigio and Tempranillo. Guests will also enjoy the bold Ten Acres Heathcote Shiraz, tying back to where it all began in 1889 for Brown Brothers with just 10 acres of vineyards. Entertainment: After lunch, you can dance to the tunes of “Preserve the Moose” bare feet encouraged. Special Guest: Katherine Brown from Brown Brothers wines will talk about winemaking and life as part of the famous Brown Brothers Wine Family.